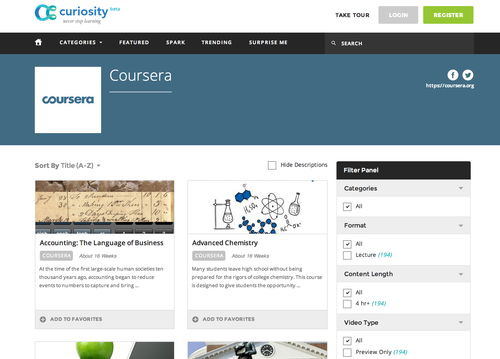 Now Explore Coursera courses on Discovery Communications’ Curiosity.com! Today, we’re pleased to announce that we’re working with Discovery Communications – whom you might recognize as the parent company of The Discovery Channel and Animal Planet – to offer our courses on their brand new destination for online learning – Curiosity.com. A major goal at Coursera is to boost educational access to learners everywhere, whether they’re seeking learning for its own sake or pursuing a more formal credential to broaden employment and career opportunities. Accomplishing this goal means building up our catalog of university partners and diverse courses, while also pursuing partnerships that bring our content to new and broader audiences. We’re excited at the potential of Curiosity.com to expand our reach and give students an additional channel for exploring their professional and personal interests among Coursera’s offerings, as well as among those of other available educational resources. Keep an eye out as we expand our partnerships further in the coming months!